Flood situation in Tripura is catastrophic. Incessant rains and landslides wreaked havoc in Tripura claiming two lives. Landslide has claimed one child at Chaigharia under Belonia in South Tripura. In another incident, one Kanthamonui Debbarma (50) was drowned at Shantinagar Gram Panchayat under Khowai sub-division on Wednesday morning. 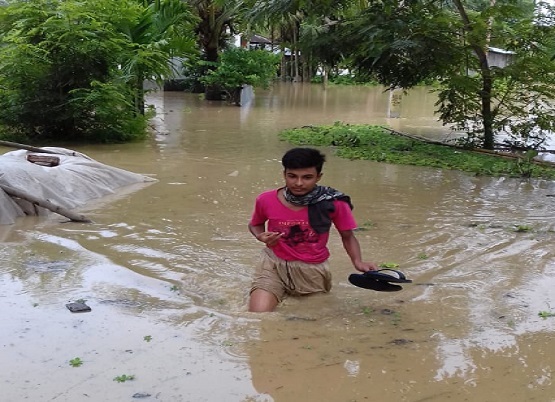 The unabated downpour for the last couple of days submerged the southernmost town Sabroom bordering Bangladesh. The river Feni is flowing above the danger level. Flood water has inundated a large tract of farm lands damaging crops. Boats have been pressed into services by the district administration to evacuate people to safer places. Administration has made arrangements to provide food, shelter and drinking water to flood hit people besides making arrangement for health check up. Communication was disrupted as parts of National Highway 8 were blocked by landslides. Administration has pressed bulldozers into services to clear the road.